Maha Navami as the name suggests is the ninth (Navami) day of the waxing phase of moon in the month of Aswayuja. 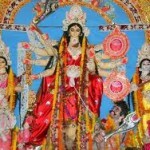 Maha Navami is celebrated on Aswayuja sukla paksha Navami. Maha Navami is celebrated on the ninth day of Sharad Navaratri festival. Maha Navami in this year will be celebrated on Wednesday, 18th October, 2045. The last day of Sharad Navratri is Maha Navami. 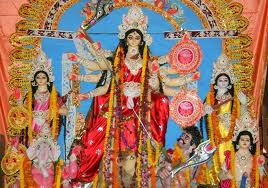 On Maha Navami is worshipped as Mahishasura mardini. Goddess Durga killed the demon Mahishasura on Maha Navami and hence got the name Mahishasura Mardini. Mardini the Sanskrit word means the one who killed or conquered. Aparajitha Devi another form of Goddess Durga is worshipped on Maha Navami. Sugar cane stalks are offered as Naivedyam to Aparajita Devi on Maha Navami. Aparajitha means one who is never defeated. In some regions, Kanya Puja is done on Maha Navami. Little girls are decorated as Goddess Durga are worshipped on Maha Navami.